*Frankenstein’s Monster: In the Marvel Universe Frankenstein’s Monster is an alien android that was created to be an ambassador to Earth, but lost his way after being tinkered with by Baron Frankenstein. -Powers: Frankenstein’s Monster has super strength and super stamina and can live forever while frozen. In this comic, he also has the power to project electricity out of his body. *Living Diamond: Living Diamond is a villain who was coined the “first evil mutant”. Living Diamond tried to turn Cyclops into an evil mutant, but is unsuccessful in his quest. He is rarely in the comics. -Powers: Living Diamond’s body is made of diamond, which makes him strong and durable. He also has the powers of telepathy and teleportation. This issue begins with scientists unearthing Frankenstein’s Monster in the arctic, not knowing what it is that they have found. After unfreezing the Monster’s body, it comes to life and attacks his saviors at the museum which they brought him too. 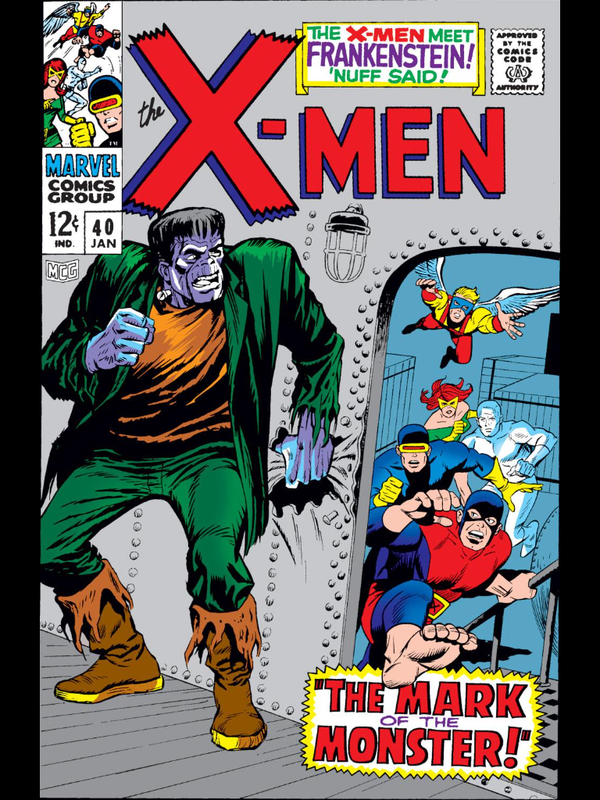 The X-Men try to defeat Frankenstein’s Monster at the museum, but the monster overpowers them and escapes. The Monster goes to the docks with the intention of returning to the arctic. Once again the X-Men attack the Monster, but once again the Monster seems to strong for the mutants. 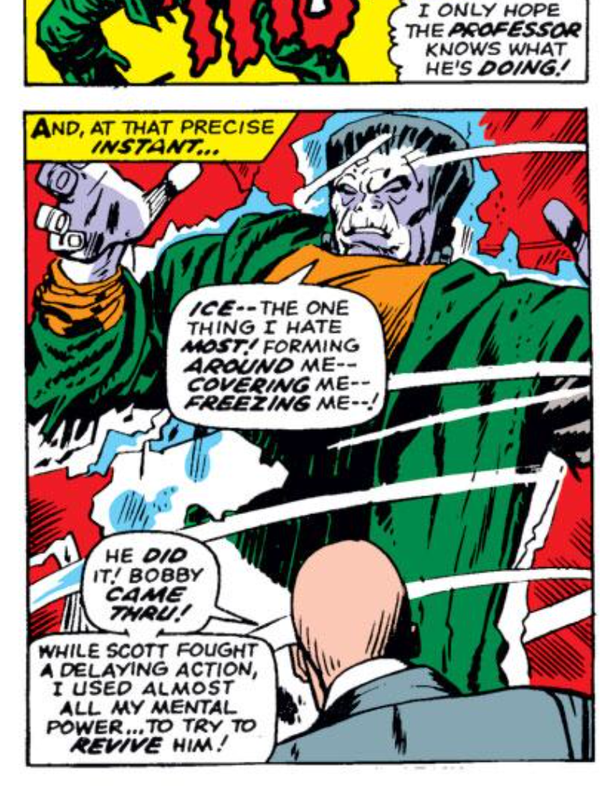 However after probing the Monster’s mind, Professor X realizes that Frankenstein’s weakness is ice. Bobby then freezes Frankenstein and the monster goes dormant. The issue then shifts back to the origin story of Cyclops, taking place right where the last issue ended. 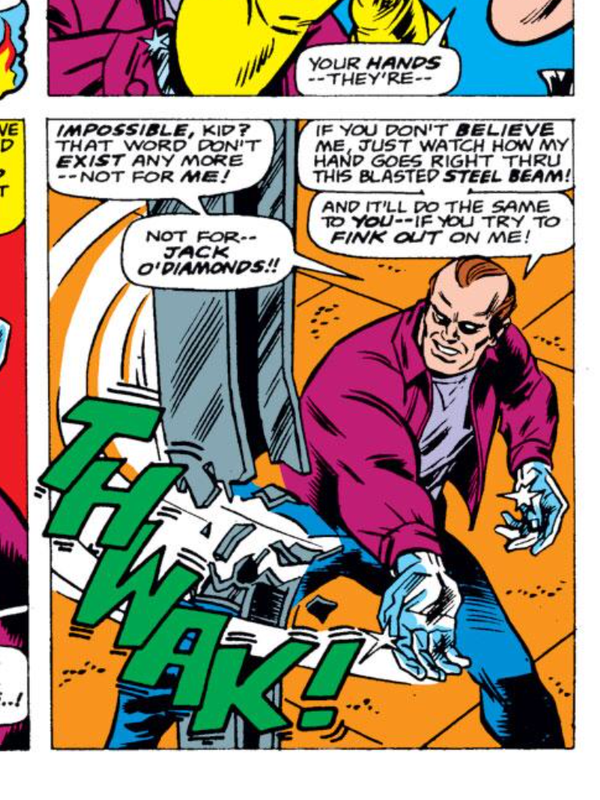 The “first evil mutant” who we saw in the last issue is revealed to be Living Diamond. Living Diamond tells Cyclops his origin story and reveals that he got his powers from a radiation accident where he worked. Living Diamond then began a life of crime. 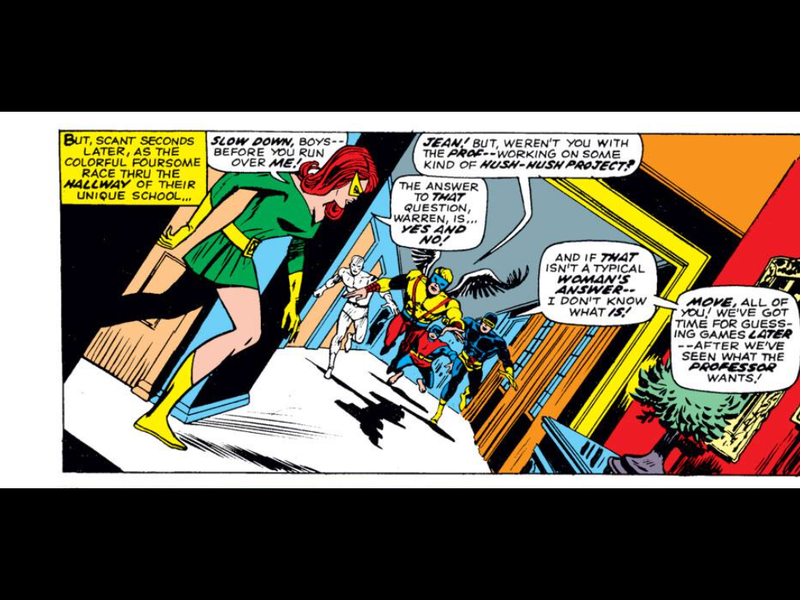 The Villain tries to convince Cyclops to join him, but Professor X intervenes. 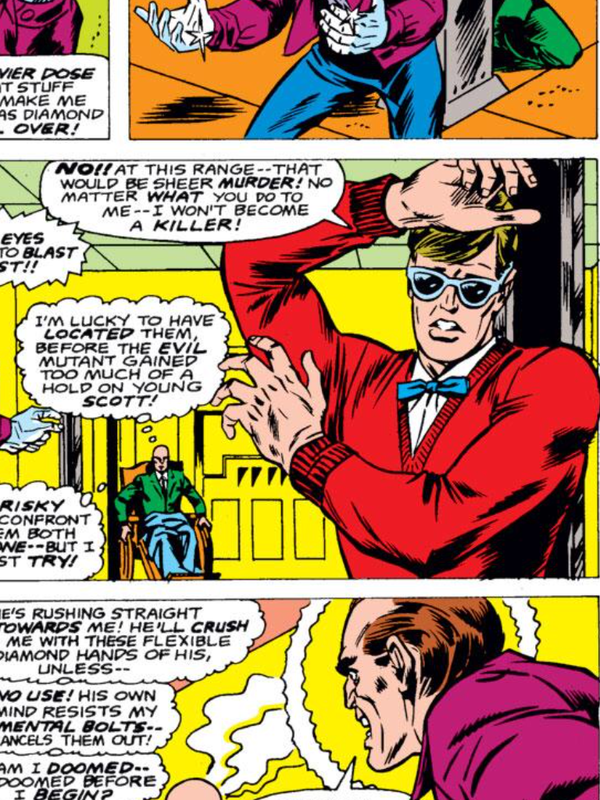 Living Diamond orders Cyclops to attack Professor X, but Scott refuses. This issue was very silly, but I enjoyed it. 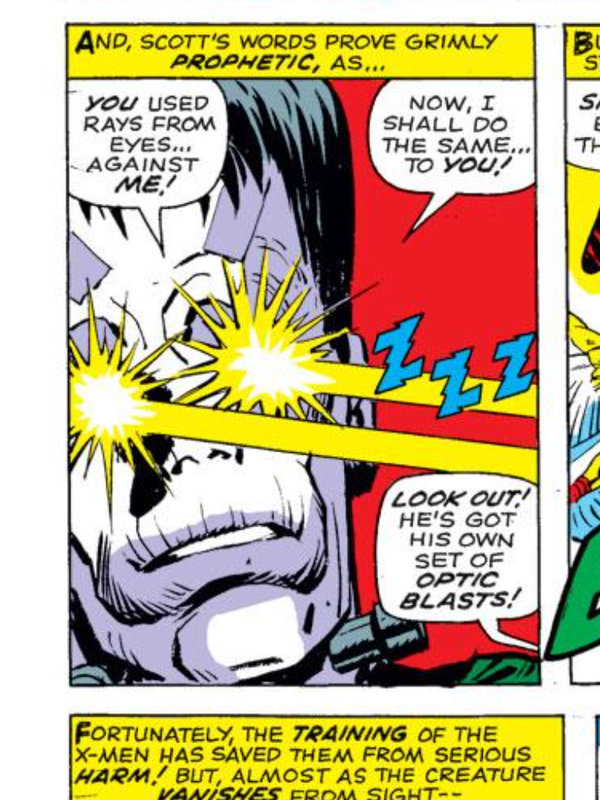 It was great to watch the X-Men fight Frankenstein’s Monster and I found it hysterical that Frankenstein could shoot electricity beams out of his eyes for some reason. I even enjoyed some of Cyclops’ origin story for once. I was intrigued by Living Diamond’s power set and I am looking forward to seeing how Cyclops’ origin story ends. My only major problem with this issue is that Living Diamond is called the first evil mutant. How can he be a mutant if he gained his powers from radioactivity? Wouldn’t that make Hulk, Spiderman, and a ton of other super heroes also mutants. I thought mutants had powers because of the DNA they were born with. I don’t buy Living Diamond as the first evil mutant. The whole Frankenstein is an alien android is completely ridiculous, but I decided to just accept this fact and not question it. Overall this issue wasn’t amazing, but it was enjoyable. Hopefully X-Men continues to improve from here. 1. Angel gets a bit sexist. 2. I enjoyed Frankenstein’s Monster’s hiding place. 3. 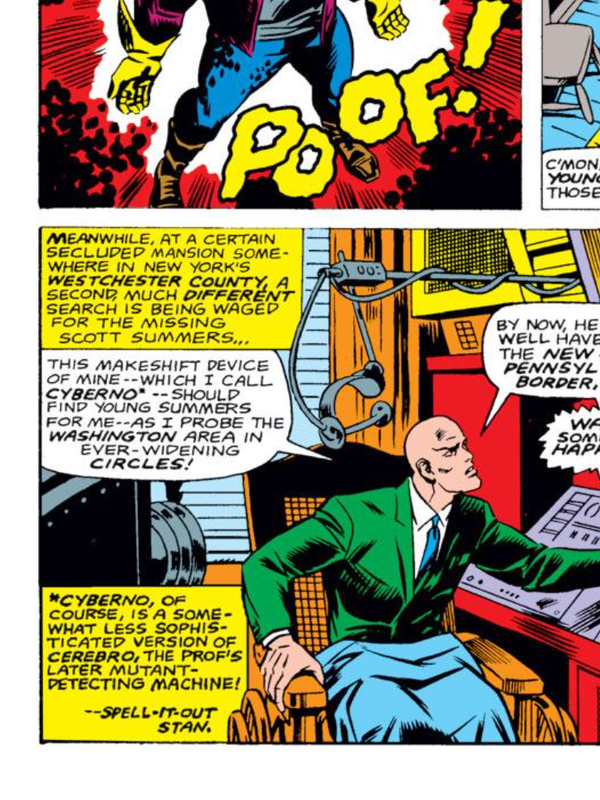 Apparently a device called Cyberno came before Cerebro. 4. 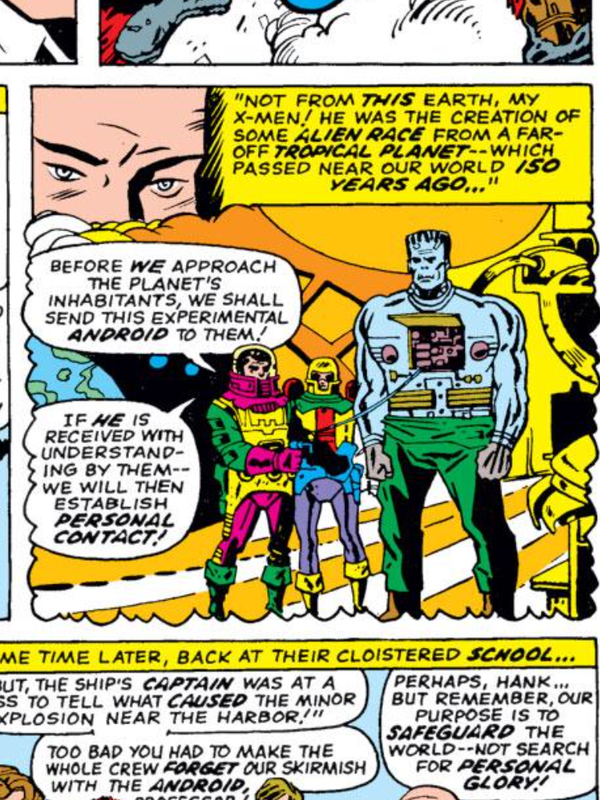 Cyclops resembles a whiny James Marsden in this panel. I think Living Diamond’s mutation is supposed to be that he can feed on radioactivity and use it to turn into diamond. But yes, it does blur the lines. 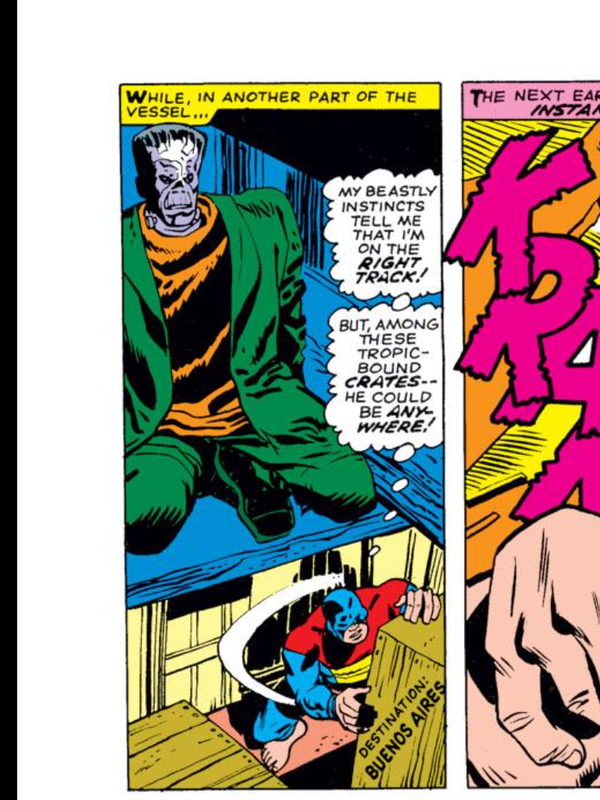 Marvel later incorporated the Shelley Frankenstein Monster into their universe as well. Your objection is well-taken. People become mutants because something, (often radioactivity, but other causes are possible) alters the DNA before the fertilized egg starts dividing. Thus, all the cells in the body have this change. As unlikely as it is that mutancy will give you superpowers (the overwhelming majority of mutations either kill the organism or don’t appear to do anything), it is FAR more likely than the Hulk, Spider-man, Fantastic Four, and now Living Diamond scenario where some radiation source alters EVERY CELL IN THE BODY the same way to give superpowers. The effects of radiation are usually random, so the cells should all come out different. I note that the Living Diamond’s power seem rather like the later Emma Frost, except that she has no teleportation powers. Also, she’s much better looking, to my biased eyes!